Pro Vitamin B is a water soluble vitamin that needs to be acquired daily, as it cannot be stored in the body. Also known as pantothenic acid, Vitamin B is made up of many different components, each having unique traits. Used topically or through food sources, Vitamin B is an antioxidant that moisturizes, retains water, helps circulation to the skin, reduce wrinkles, and treats acne, hyperpigmentation, eczema, and rosacea. Vitamin B can absorb water through the air, creates a moisture barrier to hydrate the skin. Vitamin B protects from harmful UV rays that can lead to skin cancer. 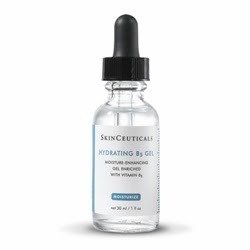 Increased circulation helps regenerate skin cell renewal and makes skin glowing and healthy. Vitamin B is a skin lightening agent that can reduce hyperpigmentation over time. Vitamin B1 (thiamine) – Antioxidant that increases blood circulation, and reverses damage from UV rays, smoking and alcohol use. Vitamin B2 (riboflavin) – Nourishes skin and reduces acne. Vitamin B3 (niacin) – Improves epidermis by retaining moisture. A derivative of Niacine, niacinamide makes skin smoother and softer, treats dry flaky skin and reduces fine lines. Vitamin B5 (pantothenic acid) – Reduces oil formation helping acne. Retains moisture to moisturize and reduce wrinkles by making skin look plumper. Helps fight Eczema. Vitamin B6 (pyridoxine and pyridoxamine) – Treats dry scaly skin. Vitamin B7 (biotin) – Major component to make skin, nails and hair healthy. Helps treat acne, dermatitis, and eczema. Vitamin B9 (folate or folic acid) - Helps control blood levels, cell division and internal functions of the body to help skin, hair and liver. Vitamin B12 (cobalamin) - helps with cell regeneration to promote healthy skin, hair and nails. Sigs of Vitamin B deficiency is acne, loss of hair, eczema, and dry or cracked skin around the mouth. Vitamin B takes fats, carbohydrates, and proteins and helps regulate, turn into energy and make them function properly. Vitamin B from dairy helps especially with dry and scaly skin. B6 is the most common deficiency, brought on by overprocessed food. A wide variety of vegetables, meats, grains and dairy give the full range of Vitamin B nutrients, having a well balanced healthy diet is the best way to get Vitamin B.